One Sunday a week ago, on our way out from Sarvana Bhawan after breakfast, we were waylaid by two little children. The elder girl, perhaps six or seven years old, and her tiny sibling, were both selling ball-point pens. Though it was a few months since we had been here, we had already bought many of these on previous visits from them and other children. So, I shook my head in response to their insistent pleas to buy the pens. But I was carrying some clothes and some sweets and I asked them if they would like to take them. They nodded and as they accompanied us, the elder one said I had given them clothes and biscuits earlier. I wondered at their remembering since it was some time since I was last there. Then she added I had last met them at Palika Parking. I smiled and said: “that must be someone else”. In the manner of children, she said then it must have been a friend of mine since the lady there had also given them some clothes. As I handed them the bag with the clothes packed in that my daughter had outgrown and the little box of toffees, the younger one fished out a tiny red laughing Buddha. It was made of some plastic. She tried to put it in my hand. I said I did not want it. “Please take it”, she insisted. Wary of being saddled with something I really did not want, I thanked her and pointed to the Ganesha on the dashboard, saying I already had one. “Didi, gift hai”, she kept saying. “Nahin beta”, I said, unclear about what she meant and unwilling to take something that she would be able to sell to someone else. The elder girl asked her to let it be. 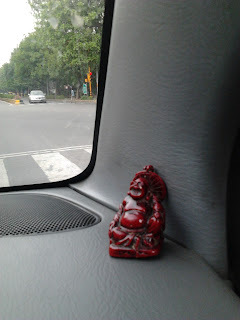 But she placed the laughing Buddha back in the car, smiling and insisting: “gift hai”. I took it finally. It would have been churlish to refuse the priceless gesture and the gift of the little girl and her big heart. Thanking her and waving to them both, I wished I had something else apart from old clothes and toffees to give her. Resolving to carry more things for them on our next visit to Sarvana, I hope and pray that they, and other little children like them on the streets of Delhi, stay safe and well. Meanwhile, the Little Laughing Buddha sits in our car, a reminder of how the gift of giving has nothing to do with how much you have. Lovely write-up and an even better experience. And a big yes to wishing all the street children well. Thanks for sharing this. Since I was there during the incident described it would seem pointless to comment here. However I have come to realise from other such incidents that people who have little in terms of worldly possessions are usually the ones who do not hesitate to "give" freely. However as we become middle class and hope to become "rich" we "give" very little to hoard whatever we have, even useless things, because to grow rich one has to hoard and eventually even attempt taking what is not ours! Thank you so much, all of you for your comments. As Snehanshu pointed out in a conversation we had, if you look at even the monetary value of the 'Little Buddha' as a proportion of the money the little girl has, it is worth a great deal more than what any of us - with greater 'worldly possessions' and money - would normally buy for our friends. And even more than that is the value of her spontaneous gesture. I could suggest a good title! How about "From Sarvana to Nirvana" ! ?